Shalom Bombay: The Review | Thanks a Glatt! « Sephardi Siddur App Now Available in the iTunes Store! 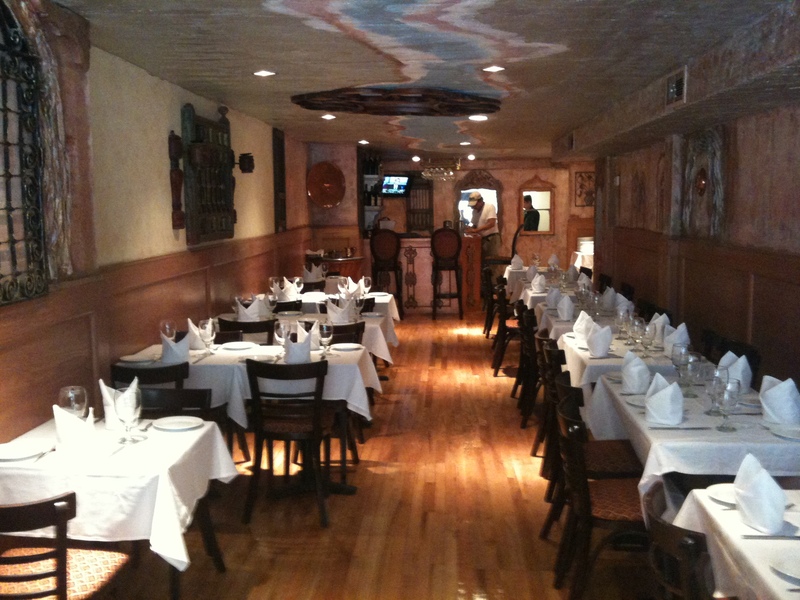 Located in midtown, the first impression you will have when you walk in is that you are in India. From the hand painted walls and ceiling to the relaxing Indian music you will feel right at home as soon as you take your seat. Fortunately this falls right in line with a new trend of Kosher restaurants that are seeing where they are actually spending money on the decor – unlike the kosher offerings of the past where it was more of a “you want to eat kosher? deal with our crappy offering” mentality of the past (Kosher Delight I am looking in your direction). The menu is full of authentic Indian dishes (and what a pleasant surprise – no sushi!) which includes a decent wine and beer selection. The second impression you will notice about SB is their service which ranks amongst the best in New York City. While I was there a patron asked for a bencher and rather than pointing to the stack of benchers the host actually brought it to them. A lot of restaurants fail to realize that people go out to eat to be served – Shalom Bombay seems to realize this and makes sure you feel like a king. Whether you are on a date or with a group I would highly recommend ordering a few dishes and sharing rather than each person ordering their for themselves. With so many dishes to choose from I think it’s too hard to pick just one so you might as well enjoy a few! 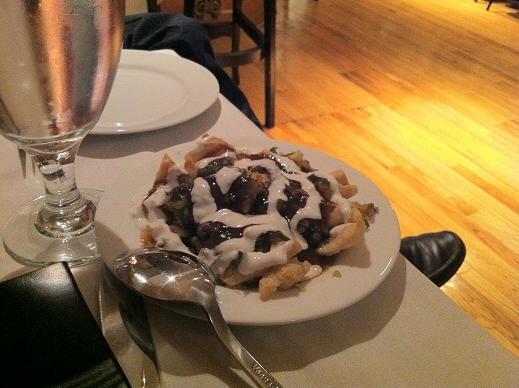 Every table gets started off with complimentary Papri Chaat which is crisp crackers served with chopped potatoes, onions, parve sour cream & tamarind sauce. I had the mixed kabob appetizer also (it seems like it is their most popular appetizer) which is a must with a group. They were spiced just right and will definitely open up your palette for your main course. Also consider ordering some Naan or Roti (Indian bread) on the side to eat with your meal – they have multiple flavors so they are sure to have one you like. For my main courses I went spice crazy and had the Curry Chicken (chicken cooked in freshly ground spices and light gravy), Lamb Vindaloo (spicy lamb with a splash of vinegar, a Goan specialty), Dal Rajma (black lentils and kidney beans simmered with onions and spices), and on the more mild side I went with the Beef Korma (cubes of beef cooked in cashew paste and mild spices). Being a huge fan of Indian food everything tasted authentic and delicious as expected. The only downer I had here was the price – approximately $20 per dish, but that is on par with any kosher entrée you have in New York City. 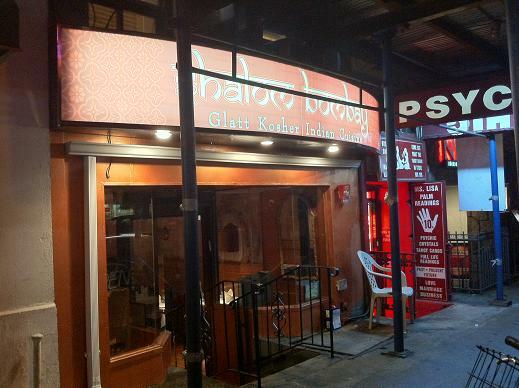 I will definitely return to Shalom Bombay (perhaps for their all-you-can-eat lunch buffet?) and recommend you check them out too if you are in the mood for something other than a burger or schawarma. They are open for lunch and dinner and do catering for whatever occasion you may have. I go for the lunch specials and have yet to be disappointed. The hosts and waiters are kind and helpful. I am looking forward to being able to take others there and sit and have the all you can eat lunch special then eating right at my desk. I had their food once and it was, how to put it, bland. There was no taste in the food. (Hey Chef, atleast put a little salt and pepper) I am never going to go there again. It was a waste of money. I’ve had Indian food before and this tasted nothing like it. It’s basically like their location in Teaneck. The food is not worth it. I went for dinner tonight and they just got CLOSED DOWN by the NYC HEALTH DEPARTMENT! Pingback: Shalom Bombay shutdown by health department | Thanks a Glatt! I just had my son’s Bar Mitzvah yesterday in Fair Lawn, NJ and it was catered by Shalom Bombay. Rafi and Jenna were great! They were helpful, making sure we felt that we can always get a hold of them with any questions or concerns during the preparation of the party. The Bar Mitzvah was a huge success. The quality of the food was phenomenal. Many of my guests who never tried Indian food commented on how good it was, even the non-kosher guests. I was concerned about how people were going to perceive catering Indian food at a Bar Mitzvah since I know so many people afraid to try ethnic foods. My love for Indian food and decision to just go for it and be daring, paid off. Everyone was happy and full by the end of the party. I have never had that experience. The restaurant in Teaneck was always wonderful and I had my son’s Bar Mitzvah catered by the NY location and they did a fantastic job. The food was delicious!